This Sunday we actually had a day that resembled summer, unusual to experience with our variable four-seasons-in-a-day British climate. We have worked out a 23 mile cycle route from home that is mostly roads (yay!) and quite a few hills (boo!) but I am trying to learn to love hills! I do like them when I am at the top, at least as it’s heavenly to cycle (roll) down them! 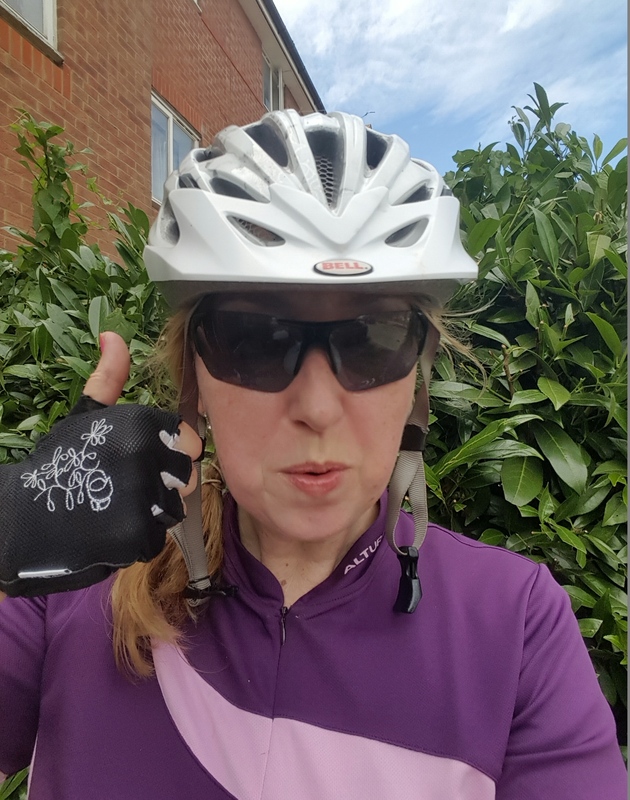 We (the man and me) had planned to get up early on Sunday to do our training ride avoiding the forecast heat, but somehow we didn’t manage to get out until nearly midday so by that time it was hot, hot, hot! I am not very good in the heat, never have been. It seems to have started when I was in Primary School and our class went to do a country dancing display at the Buckinghamshire County Show (how very British!) on a boiling hot day. Sadly I ended up with heatstroke as it seems that my pale English, freckly skin does not much like activity in the humid British heat! I know this is potentially an issue if the day of the ride dawns and it is super-hot, so I have to push through it. So push through it I did by drinking loads of fluids on the way round which definitely helped. Knocked 5 minutes off the previous week’s cycle time at just under 2 hours, which is pretty okay considering the heat! Made it in the heat! When we go home we went for a “cool down” (code for cycle to the local pub for a drink in the sun) but the closest pub garden was already full, so we cycled on to the next one. This meant we upped our miles more than we were expecting. Total cycle ride: 30 miles – 23 at a reasonable pace, 7 very slow! On the last couple of miles, I was definitely ready to be home. Thank you for your financial and/or moral support to this cause! Beware stretchy clothes – for they are the enemy! So I wrote in a previous post about staying aware and staying changed. This morning, I had the perfect wake-up call for this. Yes, I went to the gym on Saturday, but yes, I also enjoyed a little break from healthy eating over the weekend. Apart from the gym, I was not very active and lolled around for most of the weekend in my stretchy gym gear or PJs. So far, so comfy! Pasta was my friend again this weekend, and so was a very pleasant dry, white wine and other things that have been absent for a while! Now, usually this would be okay, under the good old 80/20 rule. In reality, it was more like 50/50 over this past week, 50% ‘good’, 50% not. And amazingly, this morning it showed in how my clothes fit. Or didn’t. Yes, dear friends, the skirt I put on for work this morning was too tight. Now, I know this is hardly world headline breaking news, but I really was a little shocked. And disappointed. It was my wake-up call! Enough is enough. Time to reverse the trend. So, beware stretchy clothes, everyone – for they are the enemy! They let you put on weight and carry on in blissful ignorance, happily in denial, until you need to wear something fitted. But, stretchy clothes will not win! I am changed. I am not in denial. I am aware. I will not buy larger clothes! I started to address it today. So that’s me, still making the change and staying changed. Too many Easter Eggs? Time to get back on the diet pony! Well, the Easter break in the UK was 4 days long and a very welcome break from work. Met up with family, celebrated my Godson’s 16th birthday and generally ate and drank what I wanted to. When I woke up yesterday (day 4) I felt more sluggish than normal – almost like a hangover. It seems my body has become used to eating more healthily – and it was not too keen on the carb-laden treats of the weekend. Stepping on the scales was none too pleasant this morning either, but no more denial for me, the Easter weight needs to come off. So, today I jumped back on the diet pony and even went to the gym after work with Wayne (Fiance). Neither of us really wanted to go, but somehow we cajoled ourselves into going. Once there, I did a good job of impersonating someone who was enjoying themselves 🙂 except for the burpees with this weird pipe thing and doing the plank on a powerplate! Ouch. If you’re reading this and you’ve over-indulged… don’t worry, just start being healthier tomorrow. Oh yes, and try to get some decent sleep – apparently it helps with weight-loss.